See Your McMurray Orthodontist for Braces in the New Year! Year after year, you look over previous yearbook photos, photos from the holidays, and now this most recent New Year’s Eve. You look at your wide, closed smile in each one and think “I want to show off my teeth this year.” With 2018 just around the corner, now is the time to schedule an appointment with your McMurray orthodontist. With so many new options to choose from, you’ll quickly find the treatment that best suits your needs. Before your next orthodontist appointment, consider a few of the following treatments to discuss with your doctor. 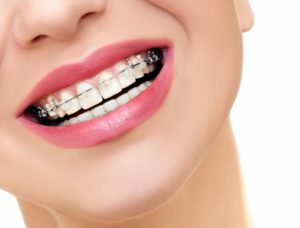 You’ve most likely heard of traditional metal braces before or seen your friends and family wear them. Today, metal braces are smaller, more comfortable, and better looking than ever before. They consist of metal brackets made from stainless steel that are bonded to each tooth. Then an archwire is clipped into each bracket that puts pressure on your teeth, moving it to the correct position. If you want your braces to be less visible, then ceramic brackets can be used in place of stainless steel ones. Regardless of your orthodontic choice, traditional braces will provide you a straighter smile and fix any overcrowding, underbite, and overbite issues. If you would prefer a subtler teeth-straightening treatment, you’ll want to consider clear aligners, as they offer several benefits on your path to a more beautiful smile. Instead of wearing brackets and wires, the dentist creates several plastic custom molds that shape your new smile over time. Products such as Simpli5 are worn for about 3 to 4 weeks at a time, causing your teeth to gradually shift into their ideal alignment. As the aligner begins to feel loose, you’ll know when it’s time to move on to the next pair. This will be done through follow-up appointments with your orthodontist in McMurray to make sure your progress is running smoothly. Orthodontic Headgear – Reserved with patients with severe bite problems. Usually attaches to braces or a palatal expander to slow down or stop the upper jaw from growing. This prevents or correct overbite problems. Palatal Expander – This device is meant to widen the upper jaw by gently separating the bones of the palate. Ideal for younger patients and those who intend to get braces. After you’ve completed your treatments, you’ll want to make sure you take care of your investment. Over time, your smile can shift back to its original position if not taken care of. To avoid this, your doctor will provide you a retainer after your braces come off. Initially, you’ll wear your retainer during the day and at night, only removing to eat. Once it’s been long enough, you’ll only wear them at night. Don’t hesitate to change your smile in the new year! Schedule an appointment with your orthodontist in McMurray today! Dr. Gary Cartwright earned his Doctor of Dental Medicine from the University of Pittsburgh followed by his degree in orthodontics from the University of New York, Stoney Brook. He then earned his Board Certification from the American Board of Orthodontics. To learn more about him and his practice, contact him at (724) 942-5130 or visit his website. Comments Off on See Your McMurray Orthodontist for Braces in the New Year!